Shopping with a baby or child has its own set of difficulties. Worrying about your child’s safety should not be one of them. There are options on ways to shop safely with your child at every age. 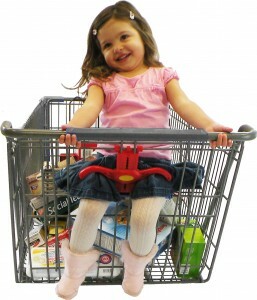 Fall Stop – An emerging alternative to the child shopping cart seat belt. Kids like to turn from side to side and lean forward to hold the handle. No type of seat belt allows for that. The initial adjustment of Fall-Stop is not dependent on the child’s upper body position as it is with any type of seat belt. Fall-Stop is easy to use and faster to engage than any type of seat belt. See how at How to use Fall-Stop. Let’s a kid act like a kid and stay safe! two to adult. The Shop-Along improves the shopping experience for parents with more than one child it has two safety harnesses for your children’s comfort and safety. 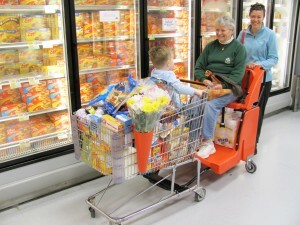 The Shop-Along is also ideal for shoppers who are shopping with most anyone who has mobility limitations. The Shop-Along has a footrest for comfort and a large area under the seat for bulk merchandise. With its easy mobility and compact design it is truly the shopping safety conveyance solution for 95% of all customers.